Bluewater is delighted to announce that the 43m CRN superyacht SOFICO is available to charter in the West Mediterranean this summer. 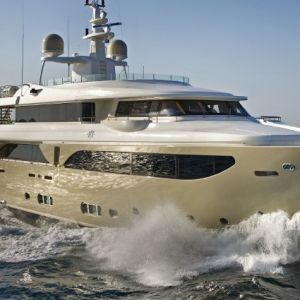 Built by CRN Ancona in 2009, this striking tri-deck yacht is the perfect option to start your charter in the South of France before exploring all the beauty the West Mediterranean has to offer, from the rugged coastline of Corsica to the picture-perfect beaches of Sardinia. 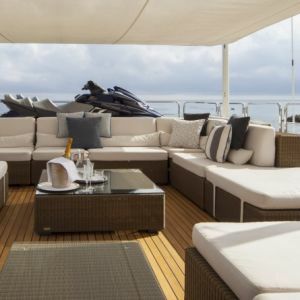 SOFICO benefits from three spacious decks and an impressive selection of water toys, including Jet Skis, Water Skis, Seabobs, a Laser Pico dinghy sail boat and a wake board. 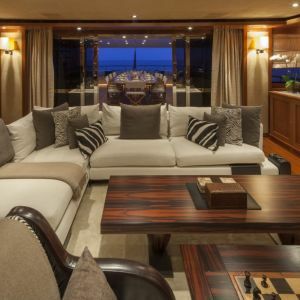 SOFICO’s elegant interior features Canaletto walnut and natural cherry wood panelling. The large saloon has comfortable seating, a bar and entertainment centre while forward is a dining area with formal seating for 10 guests. 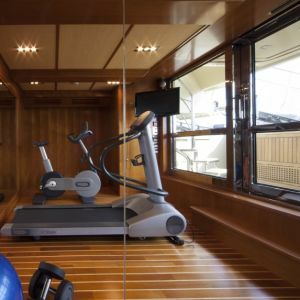 For musical guests onboard, the sky lounge is equipped with a piano, and the sporty charterers will be able to enjoy the state-of-the-art gym and sauna. Accommodating up to 11 guests in 5 well-appointed staterooms, this charter yacht boasts a stunning private terrasse in the Master suite. Please contact Irina Blogodyr to book your summer yacht charter onboard SOFICO. Exciting new Sanlorenzo SL106 motor yacht SALT, available for charter this summer.